Audiobook "Pendalgin: a remedy for delaying cases"
with the elaboration of all exercises. Repeat if necessary. The drug is released on the recommendation "Vertex" and "Code of Life." Anton Mironenko is a hypnotherapist, business coach, creator of the project on self-development "Code of Life". Held more than 900 consultations to improve the internal state, 494 business training. The author of the books "Free! How to escape from the mental prison "and" Illusion of life ". Sergey Filippov is a business coach with more than 1000 trainings. Among the clients: Coca-Cola, Allianz, Sberbank, Metro International, Beeline, AVIS, etc. 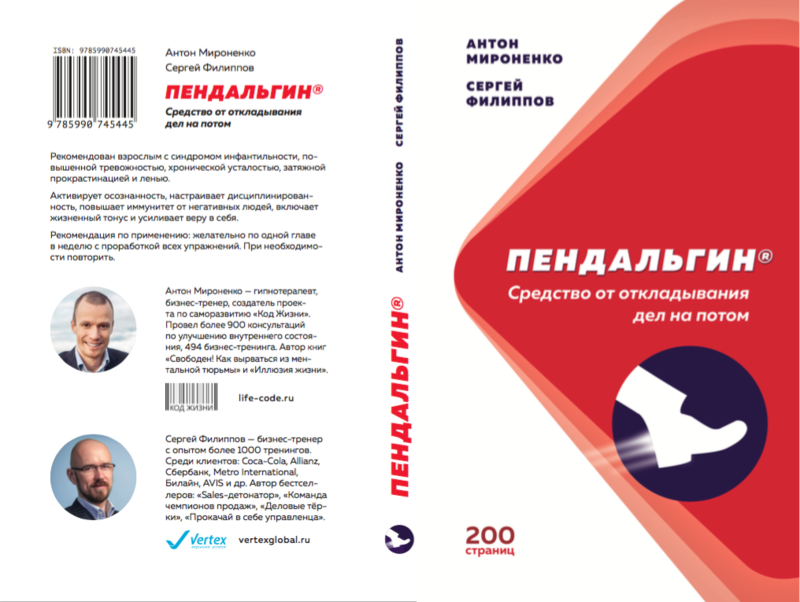 The author of bestsellers: "Sales-detonator", "Team of sales champions", "Business graters", "Pull over the manager".